Enlightenment: Don't Just Look Down At Your Feet, Look At The Stars, Be Curious! Fireworks at Paralympics Opening Ceremony! Prof Hawking's countless scientific papers, best-selling books and numerous awards have earned him comparisons with both Albert Einstein and Sir Isaac Newton. The 70-year-old, who has lived with debilitating motor neurone disease since the age of 22, went on to lead the 80,000-strong audience and more than a billion viewers on television through a 'journey of discovery.' This was inspired by his seminal book 'A Brief History of Time', in which he proposes a model of the universe which has no boundaries in space or time. He is most famous for his discovery of 'Hawking Radiation' which allows a black hole to leak energy and gradually fade away to nothing. By applying quantum mechanics to black holes, he took the first steps to combining quantum theory and general relativity. One describes the universe at the sub-atomic level, and the other at very large scales. Bringing the two theories together is one of the great unfulfilled goals of modern physics. This was the moment the Paralympics returned home to the country where its foundations were first conceived 64 years ago in 1948. The 'Opening Ceremony' directed by Bradley Hemmings and Jenny Sealey revolved around an interpretation of Shakespeare's 'The Tempest' with the central character Miranda – played by 34-year-old disabled Gloucester born actress Nicola Miles-Wilden – taken on a voyage of discovery by Prof Hawking. The voyage across 'a sea of ideas' began when the pair travelled back in time to the 'Enlightenment' and walked through a recreation of the garden where Sir Isaac Newton discovered gravity -- through the falling apple -- which all Earth-bound athletes strive against. 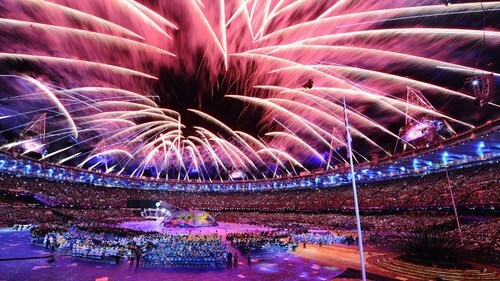 The 4,000 athletes from 164 nations were deliberately given a central role in the performance. They made their way around the stadium, some hobbling on artificial limbs or prosthetics, others using walking canes and wheelchairs. The show included 73 deaf and disabled professional performers and 68 disabled people among its 3,250 volunteers.